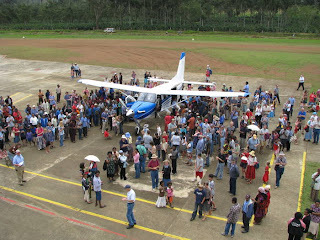 Friday our centre received a new airplane. The Kodiak. Aviation staff are really excited about this plane for many reasons. Not the least of which is how it should be able to do everything our current planes do, but with more cargo capacity. Plus, it's always nice to receive something new. Very often what we receive to work with is a hand me down, or a donation. These are always appreciated greatly, as often times what is old to you, is new to us. But this plane is brand new... built specifically for us! On Friday many of us went out to receive it and dedicate it to God. Also today, some of our friends who have been gone 10 months on furlough return! This is a boon professionally as well as personally as the husband is our only radio technician on centre, which means my department can still continue to repair radios. Something we use a LOT of. Every person here contributes so much that when they leave, either their job can't be done because they were so specialized, or others pick up the slack. So people returning is always a blessing, and it lifts our spirits up again to see friends. We have been here long enough now, that we have seen people leave on two year furloughs and return. We've seen people leave, have babies and return. We've seen babies have their third birthday. It's remarkable that we've been here 2.5 years already. I may have mentioned my son and friends going under the house a while back. The majority of our house is about 2 feet off the ground, supported by many posts. Many of the houses here are supported this way, it allows for a cooler house during the hot times, a dryer house during the wet times... and is a culturally appropriate way to make a house. Ours was originally built by a family who dedicated the first Bible here in 1973, the year we were born. God gave us the money for it miraculously and we're happy to have a home. The other day though we were talking about bugs eating wood, and Calvin said "oh that explains the posts under the house." he continued to tell me that while he was under there he saw many supporting posts that looked all eaten up. Sure enough upon inspection I found one or two. So I called construction over. They investigated, went under and came out saying "We're surprised your house is still standing." Who doesn't love to hear that? and then "have you noticed the floor sagging?" today they are under the house cutting treated posts and putting down cement. The problem was that back in 1970 when the house was built, concrete wasn't used and the posts were plain, untreated logs. Thankfully however, the entire repair will run us less than $500 USD, thanks to the power of the US dollar right now and the cheap cost of manual labor in this country. I'm really thankful Calvin went under the house that day!!! taken in 2007 from one of the translator couples that we support. I don't live on the coast. It takes me several hours of flying to get to a place like this... but when I visit... ooooooh it's pretty. This is evidence that sometimes, when God calls people to missions, it's not always to a dreadfully horrid place. Sometimes, He calls us to serve in some very pretty places. "yes, thanks God, for reminding me." I think it would be near impossible to serve in a place I didn't find beautiful, because you see such ugliness, that my eyes need the medicine that is the beauty of this terrain. For a long while our neighborhood was pretty empty. Most of the folks around us were gone. But for a few weeks now it's been back in full swing again. The other day I set up 3 benches made out of a tree that fell in our yard over a year ago. I put together a little fire pit. Lit some citronella to keep out the mosquitos and then we had a nice little smores roasting, banjo playing fire. We called the neighbors over who were at that moment, trying to make their own fire pit... and they dropped in. They have a young boy in my wife's preschool class. He's an only child and loves Calvin, so he drops in all the time. Often times without telling his parents he's at our house. Today he said "Mister Chad, my pedal fell off". Well I took the pedal and welded it back into place on his bicycle. And while doing that it dawned on me... that we have neighbors again. We really like the drop in, say howdy... type of environment. For so many months it has been only us down our lonely road... and now... it's full of people again. And that thought really lifted my heart a bit. Thanks for that little blessing today God. I think the problems have been resolved! So, the past couple of days have been mellow but nice. That kind of nice that has meaning and feels good. This is a day once a year when the school (primary) is divided into two teams. Red vs. Yellow. the kids compete in track and field, obstacle courses, crazy inventive games, and generally compete against each other in a healthy environment that encourages team and individual achievement. Our kids each game home with 3 ribbons of differing places. Most kids go home with at least one, as there are many team events. The finale, is the tug of war. And although both my kids were on the red team, and behind the yellow, in the end, they won the tug of war, but lost the day. Still they really enjoyed the day at school without book learning. Of course they enjoy the book learning too. Pictured above is my daughter after her team won the base run (baseball diamond relay race with batons) and my son in the middle of the rope climb on the obstacle course. 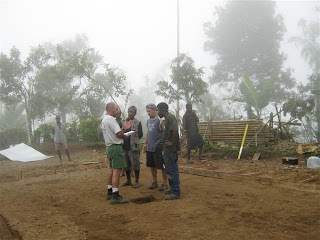 a friend of mine is in the village right now building his house. he's a translator. A translation project has a lot of work to be done outside of simply the intellectual work of translating the Bible. Setting up a new project requires you build relationships with the people you will be living with. It also requires eventually having a place to stay. Some locations that are reachable by truck, can build kit houses. But if you live in a helicopter allocation where trucks can't reach, then it becomes VERY expensive to fly in all your own lumber. SO, you cut the lumber from trees. To do that you need to get someone to sell you their trees, or to lend you some help. My friend has cut down the trees with a team, then milled them and made them into boards. Then he took a rest. For these three weeks he's out there building his house with the help of support workers like me. Construction skills, carpenter skills, building skills, even cooking skills, are all required to help bring together a house in the village. That final shot is the water tank being lifted in. I live in the Eastern Highlands so I almost never get a chance to fish in saltwater. I do live right next to a river but I don't fish there because a) the water is full of bacteria and b) the nationals depend on fish for meals. So I won't make a sport out of what is their necessity. We were out on a boat however, traveling to a Bible dedication and we dropped a line in the water. The boat only went 7knots so it was a fast troll but not too fast. A little bit of frayed yellow rope on the hook.... and eventually we heard the telltale ZIP of the line. We hooked a 2 foot long barracuda and the captain's son reeled him in (10 yr old boy). 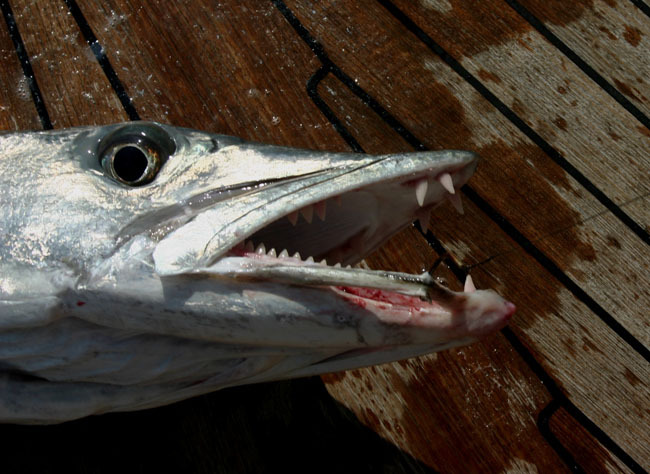 I had never caught a barracuda before, nor had I ever seen one face to face. It had teeth! Nice. Often times along the coast (when we visit) we will see young boys out in canoes. They tie a bit of line and a hook onto a water bottle or something round they can reel the line back up on. sometimes they use a bamboo pole. Sometimes rope is a lure, sometimes a piece of banana peel. Sometimes they aren't out on canoes but instead they're walking barefoot across coral. CORAL.. their feet are so tough they can do this. They truly are skilled fishermen, without all the niceties that we hobbyists have. A tackle box? Why do you need more than 1 lure? I spent some time chatting with one of the local kids as he was fishing and it simply seemed the thing to do. School was out, and he had nothing to do, so might as well do nothing with a line in the river. See if he could catch anything. It is good to see folks out fishing. You know if there are a few boys in the water, that it's a safe place to swim, and you know if they jump and run, so should you. They see the fish and know which ones are dangerous much faster than we would. One time Sydney was out playing with some boys who jumped up on the coral and ran a few steps. "A fish that gets bigger, very bad." I'm assuming they meant the puffer or the blowfish. Either way, it was a nice warning system to get my daughter out of the water. a year ago cell phone service was made possible in this country. this is my version of the story... so it is not totally accurate to every detail. The main entity in this country that controls telecommunications we will call [BIGBROTHER]. So, for years [BIGBROTHER] would not license any form of communication outside their control. It made more financial sense to maintain the monopoly. Then there was a reorganization of entities, and a governing body opened the country up to competition. Seeing the value that it would bring. There was about a year of influx, competing internet and cell service came in. Quickly realizing their mistake, the entity shut off the valve. Stopped giving licenses to competition and tried to revoke the licenses of the existing competition they let through. As a result civil suits began. Civil suits orchestrated by the competition who could not sue legally because of the terms of their license agreements. So they got their bigger customers together to sue for them. All the while, [BIGBROTHER] has had organizational difficulties and lost the suit. So now it's legal for cell phone service competition to exist. Enter cell phone competition we'll call [BetterCell]. Not only do they put a lot of towers up, but they do it along the roads where [BIGBROTHER]'s towers often neglected coverage for the main roads here. And they offer more affordable rates, free phones. They do a good job of deploying here. Suddenly [BetterCell] gets more market share. To put up a tower, you have to build a small fortress to keep raskols from stealing copper and aluminum. So cinder block walls, chain link fencing, razor wire, and power generators all go into these [BetterCell] towers. Well recently, one was built near us. And boom, we have cell phone signal! And hey, it has GPRS on it (not 3g, not for a long while). And HEY you don't need to subscribe to this GPRS because the country is still a village based country. BILLS and CREDIT CARDS or any form of credit still isn't really viable here. So pre-paid calling cards enter the cell phone world. "Top up cards". And you can use the GPRS system if you know the APN, which is published on the web site. So I get my cell phone online... and then the signal goes away. The village family line that owns the property the tower is on, is not happy with the agreement with [BetterCell] and wants more money. So they threaten to tear down the tower unless they get more money. Negotiations ensue. The signal comes up. The signal goes down. Finally we're told, that the signal is coming up for good. Until the next compensation cycle. A compensation cycle, as we call it, is the time from when the fathers own the land and get their "money" to the time those fathers pass the land on to their sons and the sons go back and say "okay now pay us." Typically it's about ten years time. The mentality seems "backwards" to western thinking in some ways. For example, if the Australian government comes to you and says "your road is dirt and full of potholes, we want to pave it for you." then you would say, "hey wow, great! that would make my life so much better!" but here they say "how much are you going to pay me for this privilege?" THOSE are the roads that are still unpaved. the thinking that goes against what is wise for your people, for your family in the long run is sometimes called "bikhet" (big head). So, right now today, I am truly apreciating the miracle that is cell phone technology. I can now get information at 28Kbit p/ sec on my phone... which means to me, besides jsut the cool geek factor of having a working iPhone in a third world country.... that I can now get information and communication from anywhere. It means safety on the roads (in a country where if you leave your vehicle it could get stripped). It means staying in touch with family. It means lowering the cost and increasing the speed of getting email into villages. It means I'm more available in emergencies (server room or family). It means simply one more way for us to get done the work we've come to do. compare that to a smart phone at most $400.00 and it's a no brainer. an hf radio modem transfers email so slowly, we measure it in Characters per second, not Kb. A smart phone with GPRS will transfer at 28Kbit/sec. So, the only trick is cell signal isn't as far reaching as HF radio. 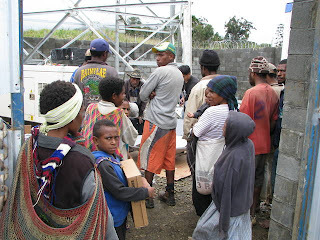 If you want to pray for more coverage, I'm sure the village workers and translators would appreciate it. The picture above is during the construction of the tower. Note the barbed wire, and the crowd of onlookers. The Cinder block walls, and the white generator on the left.